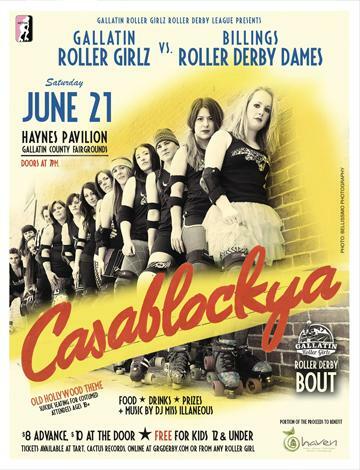 The Gallatin Roller Girlz (GRG) are rolling out the red carpet on Saturday June 21st for Casablockya, the 2nd home bout of the 2014 Summer Season. The Girlz will be hosting the Billings Roller Derby Dames (BRDD) at the Haynes Pavillion for this an old Hollywood themed roller derby bout. This will be the first time BRDD has come to GRG’s turf! The Girlz have grown and improved since they last played BRDD in February 2013 and this time they plan to dominate the track! The Gallatin Roller Girlz, a 501(c)3 federal non-profit, have been training hard and traveling the region, bouting leagues from Montana and surrounding states eleven months out of the year. GRG achieved WFTDA (Women’s Flat Track Derby Association) apprenticeship designation this January and are currently working to achieve full WFTDA membership – allowing for ranking at the national and international level. This family friendly event features food vendors, a no-host bar, half-time entertainment by Taiko Drummers, games and raffles. Music by DJ Miss Illaneous. A portion of proceeds from Casablockya will benefit Haven. Priority Suicide Seating is available to costumed attendees ages 18+ - think vintage glamour, Bogart and Bergman. Doors open at 7pm, Bout starts at 7:30pm. After party to follow at the Zebra Cocktail Lounge. Pre-purchase discounted tickets available at tart (in the Emerson), Cactus Records, from any roller girl or guy or online at grgderby.com. Tickets are $8 in advance or $10 at the door – KIDS 12 and under enter for FREE!